Tuolumne County will start on the job of removing 9,000 dead and dying trees that threaten roads, water supplies, and infrastructure this month. The state will pick up most of the cost but there's no help for private homeowners. 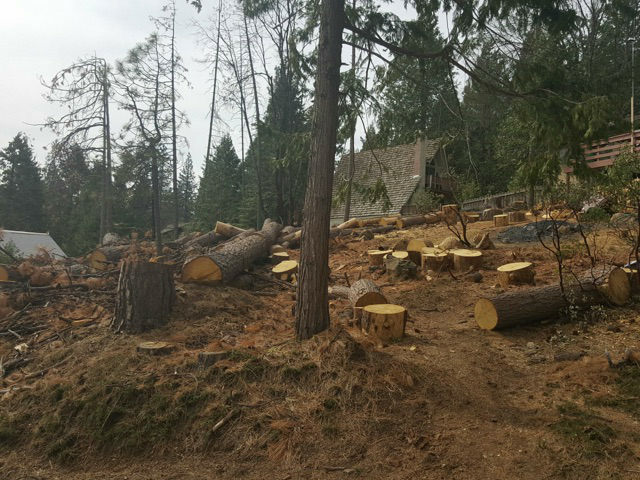 Tree removal contractors in Tuolumne County are getting ready to cut and haul away timber that didn't survive the drought. Under an executive order from Governor Jerry Brown, the state will pay 75 percent of the $9 million cost of removal from public land. Forty-four percent of the county's roads qualify for federal funds which will reduce the county's share from the remaining 25 percent to just over 6 percent. Tuolumne County Deputy Administrator Tracie Riggs says private property owners won't get help unless their trees threaten public roadways or infrastructure. "We even heard a homeowner call in that just the cost to remove the trees that PG&E had already fell was $9,600 and our homeowners simply don't have the means to take care of that," says Riggs. Riggs says the removal project will take several years and trees are still dying.